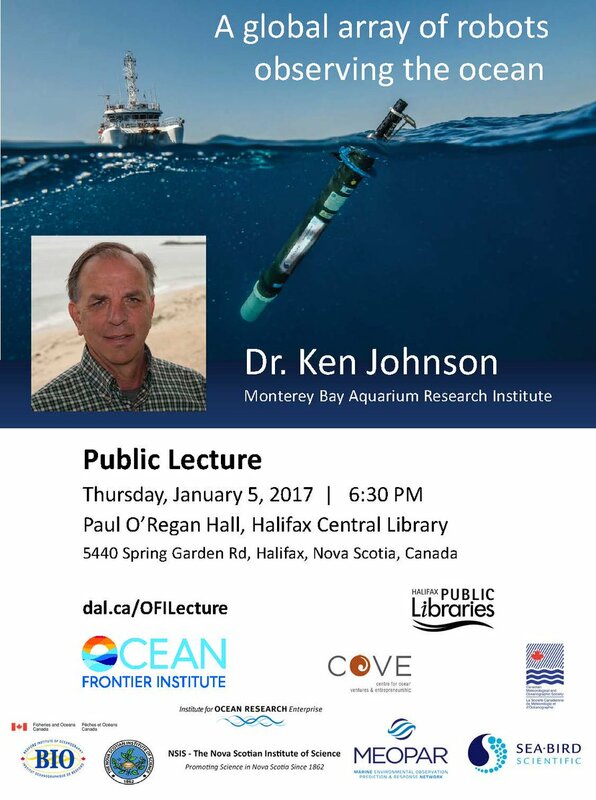 While home for the holidays in Halifax, Nova Scotia, Emily attended a public lecture presented by Dr. Ken Johnson, a scientist at Monterey Bay Aquarium Research Institute. Dr. Johnson is a chemical oceanographer and inventor, whose research focuses on developing chemical sensors (notably, nitrate and pH) that can be deployed on profiling floats. During the lecture, entitled "A global array of robots observing the oceans", Dr. Johnson stressed that vast areas of the ocean are undersampled, with sampling occurring mainly in the summer (due to logistical issues - who wants to traverse the North Atlantic on a ship during the dead of winter?). This under sampling has hindered our ability to monitor changes in ocean warming and acidification which are being driven by increasing carbon dioxide levels. We need a new generation of ocean observing tools to improve our global ocean prediction systems. As one might surmise from the title of the lecture, the future lies in global arrays of robotic sensing platforms, which in collaboration with satellite systems, would revolutionize our understanding of ocean carbon uptake. Dr. Johnson mainly discussed Argo, a fleet of 4000 profiling floats which measure salinity, temperature, and density in the upper 2000 m of the ocean in or near real-time. The Argo system has been operational since the early 2000s, and is now the dominant source of information about the state of the oceans. Plans are underway for an extension of the Argo array to include biogeochemical sensors for pH, oxygen, and nitrate, among others; this new generation is appropriately entitled "Biogeochemical-Argo". Perhaps our POSUMS and Biogeochemical-Argo will find some way to collaborate in the future...? 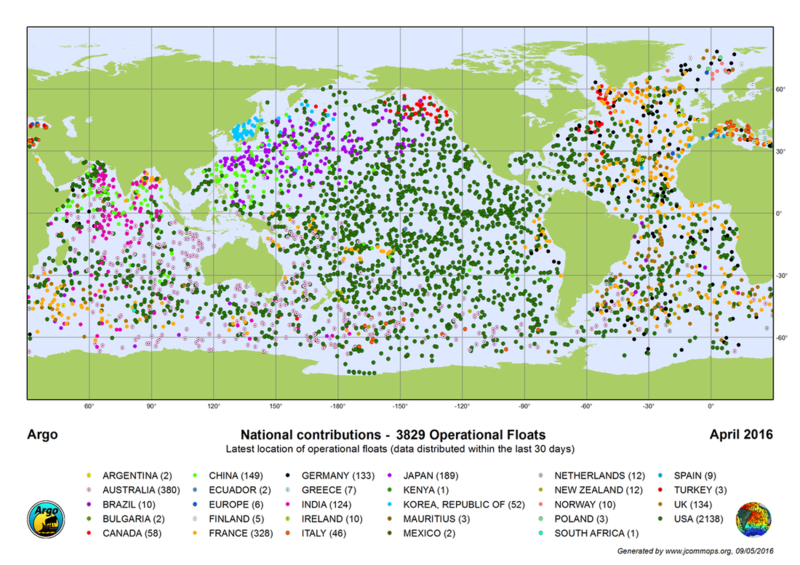 Locations of Argo floats worldwide as of April 2016. The end of another semester has arrived! Final exams have been written and class projects submitted. Emily has also met with potential members for her five-person Ph.D. committee, and will hopefully have her first advisory meeting in the upcoming spring semester. In the lab, she has commenced setting up for two new experiments. The first involves the use of a "packed bed" - essentially a column filled with sediment, across which the pressure drop can be measured. This experiment will establish the range of sediments in which the POSUMS peristaltic pump system is capable of sampling. The second is to conduct and validate POSUMS measurements of dissolved gas (methane, nitrogen, oxygen, argon, and carbon dioxide) concentrations in sand porewater. For this, Emily will make use of her four, brand-new, certified gas mixes, which will be bubbled into a sand-containing bucket. Expect photos and updates in the near-future! This week ended with a bang - namely, the Alumni College. On Friday afternoon, a number of BU alumni toured the Earth and Environment department, and the Fulweiler Lab was one of the stops. Emily presented a short overview of the project and demonstrated the ability of the porewater sampler/valve system to sample different beakers of water (colored with dye, to represent different depths in the sediment). The alumni, including doctors, lawyers, and historians (and even one former professional chef! ), were very enthusiastic in their questions and seemed quite interested in the project. On another note, we've come up with a new name for the overall instrument (which we've been calling the "Pw-MIMS", for Porewater Membrane Inlet Mass Spectrometer). 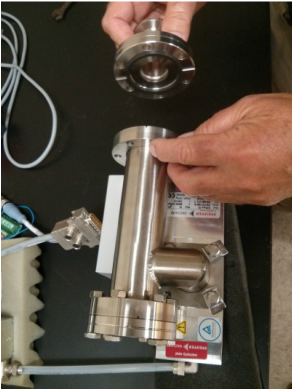 Behold the POSUMS (POrewater Sampling Underwater Mass Spectrometer)! We think this name is apt, since like those possum pests, we aim to be prevalent throughout the world's oceans. Furthermore, possums like to play dead, and we are designing the instrument to be "invisible" to the environment in which it is sampling, in order to minimize artifacts. Sunset walks in Monterey Bay - a peaceful end to a jam-packed first day at Oceans 2016. A porthole view into the kelp forest at the Monterey Bay Aquarium. Spot the shark swimming by! 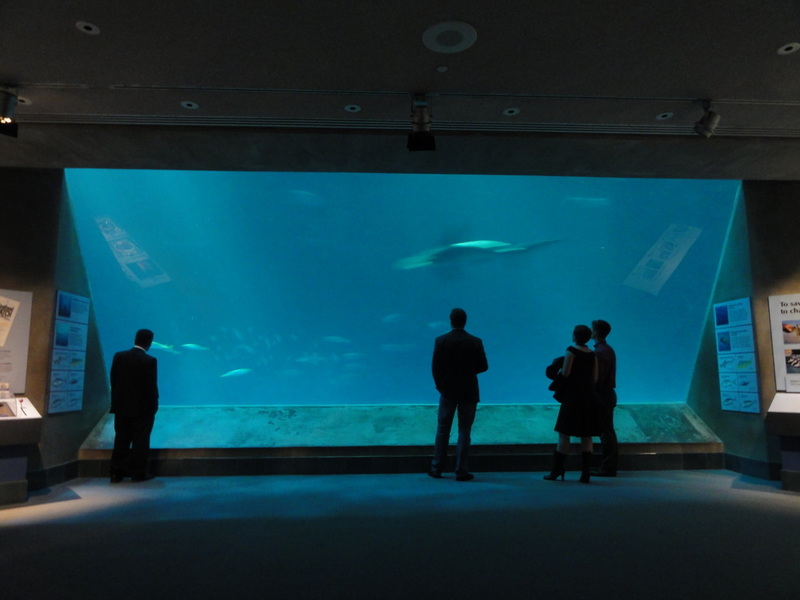 Dinner theatre - eating dinner while watching mesmerizing ocean creatures. Yes, salmon was on the menu. Coffee and tea with a side of ocean life. Multi-level view of the 8.5 m tall kelp forest. 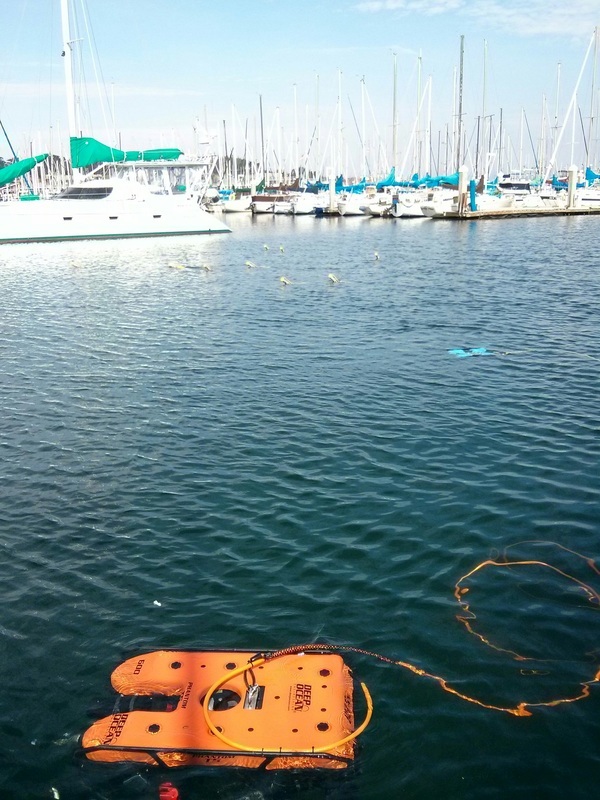 AUVs (in orange and blue) and ocean robots in action! The yellow swarm of robots played "follow the leader" and maintained a set distance from each other using GPS. Both setbacks and progress took place this week. Starting with the bad news: The new, $750 power supply (BK Precision) has been misbehaving and had to be sent back to the company for repair/replacement. This instrument is vital to the bucket tests as it will be used to power the pressure transducer which will allow us to determine whether the pore water system has become clogged. Fingers crossed that BK does not send a lemon this time. The progress: Based on Bill's suggestion, Emily measured the "sphere of influence" created by each inlet of the current pore water sampler prototype. We want to avoid drawing overlapping volumes of pore water through neighboring inlets, and to assess the spatial scale of each inlet's influence, Bill came up with the idea of reversing the flow, sucking dye into the sampling loop, and observing the scale of the dye ejected at the inlet. This dye volume is equivalent to the volume of pore water that would be drawn through the inlet. First, Emily measured the size of the sample loop volume. Two separate methods gave identical results of 2.5 mL. This amount of dye was then drawn into the sampling loop and ejected through sequential inlets, using the novel valve system. The dye spots were measured to be 2.5 cm in diameter, and so the inlets must be spaced at least this distance apart. Emily also started classes this week. She is taking a Fluid Mechanics course as well as a graduate-level math course over on the engineering campus. Given her background in Physics, Emily is enjoying these classes so far! Tracking the progress of the 2.5 mL of rhodamine dye injected into the pore water sampling loop. Visualizing the "sphere of influence" of each pore water sampling inlet. Shockingly, this is it - the last week of summer. With classes starting up after the Labor Day weekend, Emily has been busy making sure the various components of the BU lab setup are working smoothly and that everything is all set for the bucket test experiments. 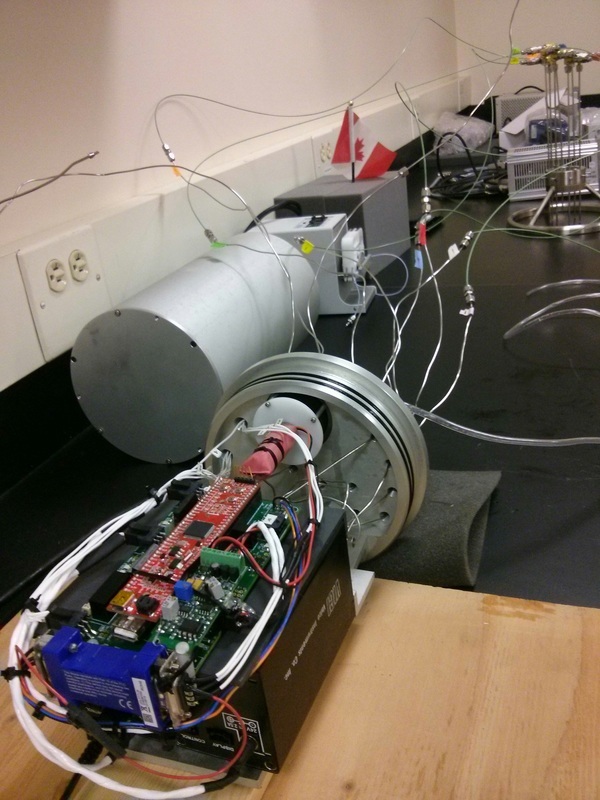 The Inficon mass spectrometer has already been performing well when interfaced with vacuum pumps and a custom-made vacuum assembly, and the next step was to integrate the heater and MIMS probe. It is important to add and test components one by one, as losing the the high vacuum necessary for operating the Inficon will result in thousands of dollars of damage! With water flowing through the MIMS probe and heated to 35°C, the system is still able to maintain a high vacuum. Emily also conducted a pressure-voltage calibration. For the bucket tests, a sediment sampling probe will be inserted in different mixtures of sand and silt. 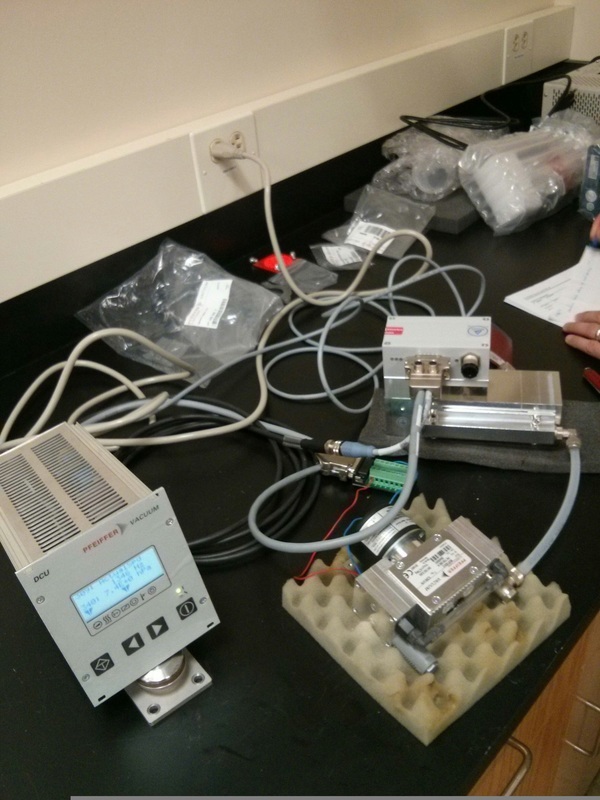 An inline pressure transducer hooked up to a voltmeter will be used to monitor the pressure near the sampling probe. A sudden change in the voltage (and hence pressure) reading will indicate that clogging has occurred. The calibration provides a means to translate voltage units to pressure units. Other Ph.D. students in the Fulweiler Lab have generously been sharing their leftover sediment from cores and water collected from the field with Emily. She will need a lot of fine silt to make her sand/silt mixtures for the bucket tests. After drying out the silt from one whole core, picking out the shells, crushing clumps with mortar and pestle, and sieving in the shaker, she produced a measly 150 mL of fines. Obtaining sufficient fines for her upcoming experiments is a challenge that needs Emily will need to address! Data displayed in graphical form in FabGuard Explorer, the Inficon mass spectrometer software. Shown in the bottom panel are the timeseries signals for certain atmospheric gases (for example, oxygen is 32 amu). Setup for conducting the pressure-voltage calibration. Equipment for filtering the water collected in Narragansett Bay. The goal is to filter out any particulate matter, but to retain some bacteria so that when mixed with sand, a biofilm can grow. Unsieved, dried-out silt from a leftover core collected in the field by another grad student. Lots of shells must painstakingly be taken out with tweezers and the silt clumps crushed with a mortar and pestle. The Fulweiler lab had another visitor this week - this time, it was PI Andres Cardenas (SRI) who stopped by for a day to check on how the set up was going. Andres brought a temperature heater/controller device that he built, which will be attached to the MIMS probe and will allow heating of the sample water to a preset temperature. He also brought an adapter which allows Emily to control the valve system using her laptop - so no more need for the chunky, labspace-stealing desktop anymore. Emily has also been preparing to start the "bucket tests", which are aimed at determining the operational limits of the porewater sampling system. A sediment sampler is of no use if it becomes clogged, and so these experiments will help define the types of environments in which the pw-MIMS can be deployed. Much as a chef prepares for a big night at the restaurant, Emily has been planning out her "menu" (i.e., a game plan for the experiments) and sourcing her "ingredients" (i.e., sorted beach sand, leftover silt, and filtered water from other grad students' field work). 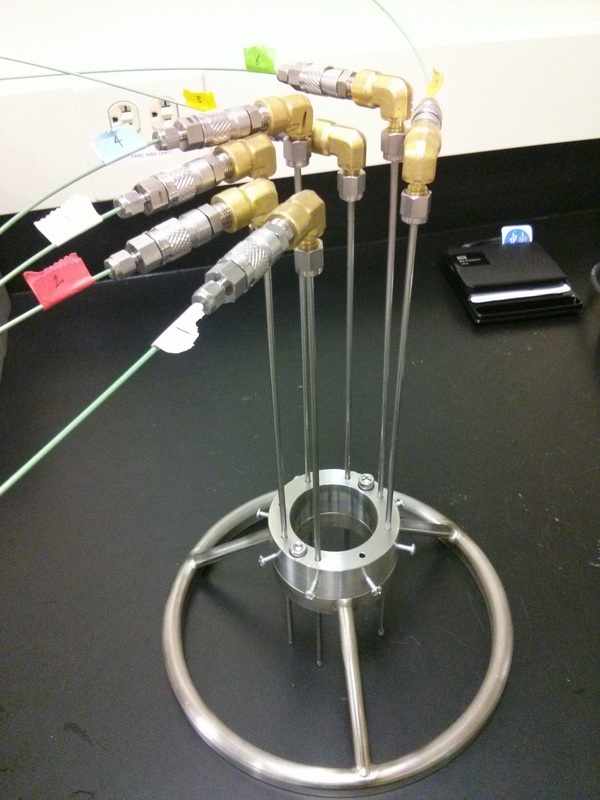 The temperature controller and heater, built by Andres using parts from Omega, will be used to heat the sample water as it flows through the MIMS probe. Will, a fellow grad student, demonstrating how to use the mechanical shaker which Emily is using to sort her beach sand into different grain size classes. This week Emily played around with a lot of sand, both of the synthetic and natural variety. In the former case, she used glass sandblasting beads and walnut shell powder as stand-ins for her "fine" and "coarse" sand, respectively, since these materials can be purchased with known grain diameters (albeit in 50 lb tubs...). Using these materials, she made mixtures of varying proportions of fine and coarse sand and measured their porosity. Emily later managed to scavenge some real sand (from a beach!) as well as sieves from another lab, which will be used for future experiments. She is also attempting to make her own falling-head permeameter, in order to measure the permeability of her sand samples. All of this is in preparation for her "bucket tests", in which she will assess the operational limits of the porewater sampler prototype by testing it in various sand mixtures - the greater the amount of fine sand, the greater the risk of clogging the system! In other news, the BU IT center built Emily a desktop with an RS-232 port, which is needed to interface with the valve system (but which modern laptops no longer have). So, after a month of headaches, Emily can finally communicate with the valve system and start testing out its capabilities! PI Tim Short (SRI) was in the Boston area and dropped by BU to spend the day in the lab with Emily. This was the first time that any of the PIs (besides Wally) have seen the new set-up at BU. Tim guided Emily through connecting the Inficon mass spectrometer to the custom-built vacuum housing, which attaches to the Pfeiffer vacuum pumps. There are still some mysterious communication problems between the valve system and new Dell PC, which controls its functions, and so Tim took a few parts back with him to SRI to investigate (which will hopefully make it through airport security...). The custom-made vacuum housing that connects the turbo pump and the Inficon mass spectrometer. An inside look at the interior of the vacuum housing... which vaguely resembles a lightsaber. The finished product - now the Inficon mass spectrometer is ready for use! 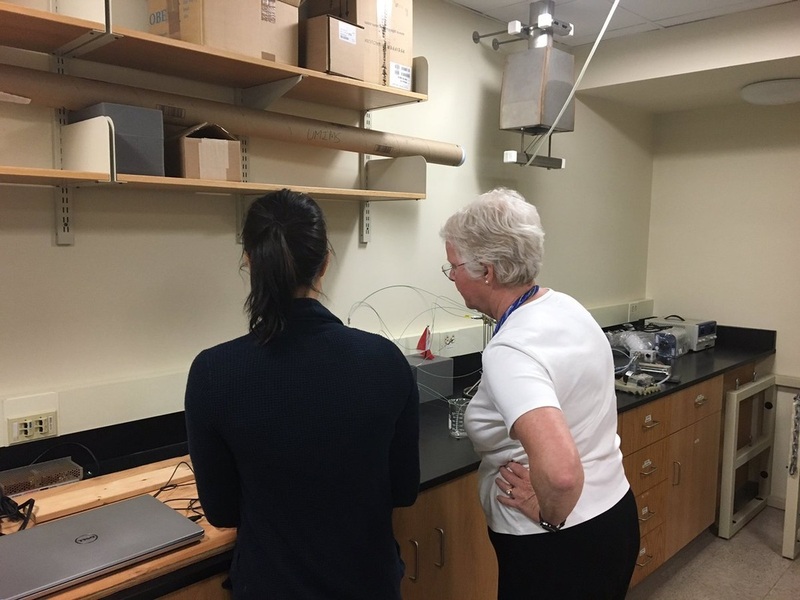 The Boston University Provost, Dr. Jean Morrison, visited the Fulweiler lab and took a brief detour to check out the porewater MIMS set-up. Emily gave her a five-minute overview of the project and set-up (during which Wally was able to snap a quick photo) before the Provost was on her way again. The set up of the MIMS probe assembly at BU is well underway! The pressure housing has been removed in order to allow easier access to the valving system during lab experiments (see leftmost picture). Progress has also been made in terms of the vacuum system, which provide the high vacuum for the Inficon mass spectrometer. The vacuum parts (turbo and roughing pumps + accessories) are from Pfeiffer Vacuum. Pfeiffer representatives were kind enough to visit twice in order to assist with set up (apparently, dispatching sales engineers to aid clueless graduate students at BU, MIT, and Harvard isn't an uncommon occurrence!) After some fiddling, the pumping system is now running smoothly. The next step is to connect it to the mass spectrometer vacuum housing. Valving system with the pressure housing removed. The seven sediment sampling probes in the support piece. Andres has been hard at work getting the MIMS probe assembly together and making sure it is fully functioning (one of the valves decided to stop working when we were testing the system during my June visit to SRI). He recently shipped us the various pieces of the assembly, and it arrived today - on Canada Day! [The Canadian flag is courtesy of Wally, and makes a nice addition to Emily's lab space].